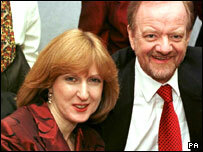 Former Cabinet minister Robin Cook, 59, has died after collapsing while hill walking in north-west Scotland. 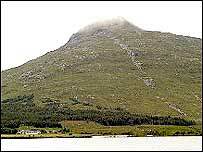 It is believed he was taken ill while walking with his wife Gaynor near the summit of Ben Stack, at around 1420 BST, Northern Constabulary said. Mr Cook was flown by coastguard helicopter to Raigmore Hospital in Inverness, where he was pronounced dead, said an NHS Highland spokesman. Mr Cook quit as Commons leader in March 2003, in protest over the war in Iraq. Following Mr Cook's death, former friends and colleagues paid tribute to him. Prime Minister Tony Blair said he was "an outstanding, extraordinary talent", in a statement released by Downing Street. The Conservative leader Michael Howard said: "He is a very great loss. He was someone who made an immense contribution to our political life." Liberal Democrat leader Charles Kennedy said: "Scottish, British and international politics have lost a good and gifted man." RAF Kinloss Assistant controller Tom Docherty said the centre had received a call about a "collapsed male walker". "He was given CPR with instructions over the telephone from ambulance control staff at Inverness." It is understood Mr Cook, who has two adult sons, arrived at hospital at 4pm, about 90 minutes after his collapse and was declared dead five minutes later, said an NHS Highland spokesman. It was more than three hours before police confirmed his death, as it is believed family members were being informed. Following Mr Cook's death, a report will be prepared for the Procurator Fiscal, as is usual in such circumstances. The Livingston MP, who lived in Edinburgh, was a keen walker and cyclist and a keen follower of horse racing. He first became an MP for Edinburgh Central in 1974 and was appointed the shadow health secretary in 1989, becoming shadow trade and industry secretary in 1992. In 1994, he became the shadow foreign secretary, a position he held until the 1997 election. After Labour's landslide win, he entered the Cabinet as foreign secretary. A Cabinet reshuffle after the 2001 Labour victory saw him replaced at the Foreign Office by Jack Straw, with Mr Cook instead given the job of Leader of the Commons. He resigned that position in the lead-up to the conflict in Iraq in protest over Tony Blair's decision to go to war. He had been an outspoken critic of the government's foreign policy from the backbench.